Can Microsoft persuade gamers to go wireless? Microsoft's Andre Reuter has told TechRadar that he believes that the next Sidewinder gaming mouse will be good enough to convince gamers that they don't need a wired mouse. 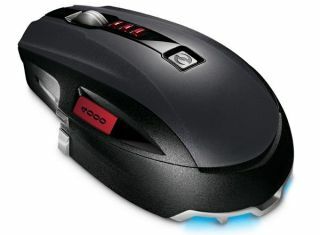 Gamers have traditionally been reticent to use wireless mice because of a latency lag. Because high-end competitive gaming is all about reaction times, the smallest delay can cause a huge difference, and this has meant that wireless technology has never been the first choice for gamers. However, Microsoft hardware's Reuter insists that the Sidewinder X8 mouse – which will be hitting shelves in February next year and will feature Microsoft's proprietary BlueTrack technology – will change even professional gamers' attitudes. "We did intensive research because we were aware of gamers' attitudes towards wired mice and the latency problem with wireless," Reuter told TechRadar at Microsoft's showcase in London. "We feel that with BlueTrack coupled with our wireless technology, and we did the tests into this, there is NO latency difference between wired and wireless. "We really dotted Is and crossed the Ts to makes sure that technically it was equal to wired mice. "It was the key research point of the mouse because of the way that gamers feel about wireless mice." Reuter is aware that persuading gamers to trial an expensive wireless high-end mouse may be tricky - but he is confident that the quality of the Sidewinder X8 will shine through. "Now we will work with experts by giving them a mouse to test and compare with a wired equivalent. We've also been working with some of the clans to get word out among that group that 'hey there is no difference'. "We know there are a lot of people whose perception is that wired is better, so, yes, we have some activities planned to break this down."